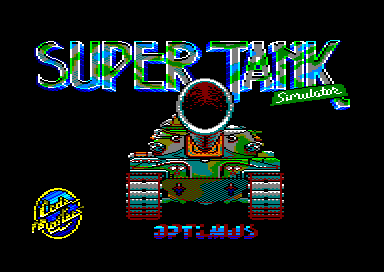 Tanks, the ultimate war machines - or so it was thought! That was until people realised that a 50-ton lump of steel crawling across the battlefield made a nice target. Now, however, dawns the day of the super tank. This NATO wonder weapon is on a mission to take out an enemy force single-handed. The first level is a view-from-above, run-of-the-mill Codemasters vehicle sim Control is tough at first because it's hard to see which way is forward, and the controls are confusing. Then all you have to do is roam around a base destroying people, places and positions. To fire, press the trigger and a rubber shell leaps from your barrel slightly slower than a speeding bullet. Shells only actually explode when they hit an enemy, so it's a good idea to practice rebounding shots of walls into targets, while you hide away out of danger. Destroying the base takes you to the second, and more interesting, level. The perspective switches to inside the tank, looking down its gun sights out into the battle zone. Due to the tank's size and weight, the movement is pretty slow, which heightens realism but hinders payability - like Operation Wolf, before the operation! 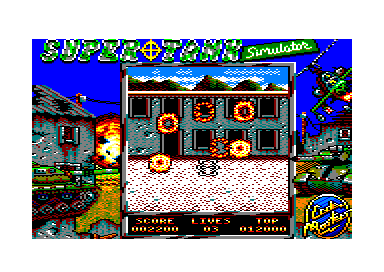 The two modes of play do not sit easily together, throwing you from an uncontrollable tank battle viewed from above, to a slightly sluggish and quickly fatal 'behind the wheel'blast. Playing takes time and patience, as the fiddly controls for the overhead sections often lead to dangerous, if unintentional, tank placement. Meanwhile, the gun's slow responses add tension in the down-the-barrel bits. Graphically, the game leaves you cold on the first level, looking like so many of Codemasters'past hits - BMX, Grand Prix and SAS sims. The second level is more ambitious and more impressive, showing the potential for such an idea. While the tunes and effects are standard fare for games, they are well above the budget norm. 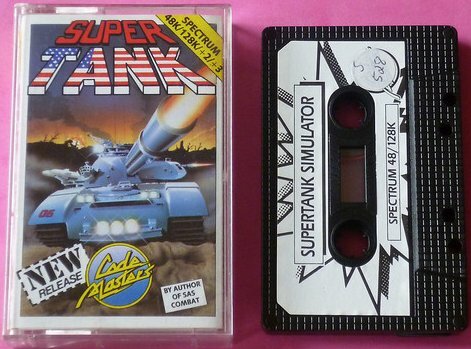 Codemasters reads markets well, and has pre-empted some of the full-price software houses in releasing a tank simulator - and will benefit from the games world's desire for heavy metal action. If you can find a quick and easy route through the first level then this is what you'll get - Op Wolf with real guns. The structuring of levels acts against the game, hiding its innovative features behind an everyday facade. But to find it will take some dedication and patience, unfortunately! 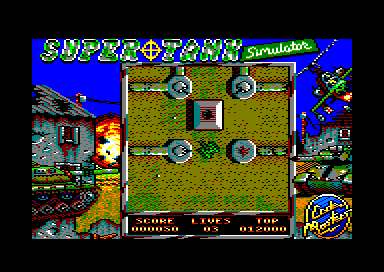 » Topic: Cheats, pokes ou solution pour "SUPER TANK SIMULATOR"